Now that school has started, we all know that fall and winter will be coming right up — not to mention the rainy and chilly days where the younger non-school children will be forced to stay inside. Sounds like the beginnings of “cabin fever” to me. What I’m doing right now, and would like to suggest to the mothers and grandmothers of those little ones, is to begin accumulating little projects and ideas for the kids to do on those “couped up” days. 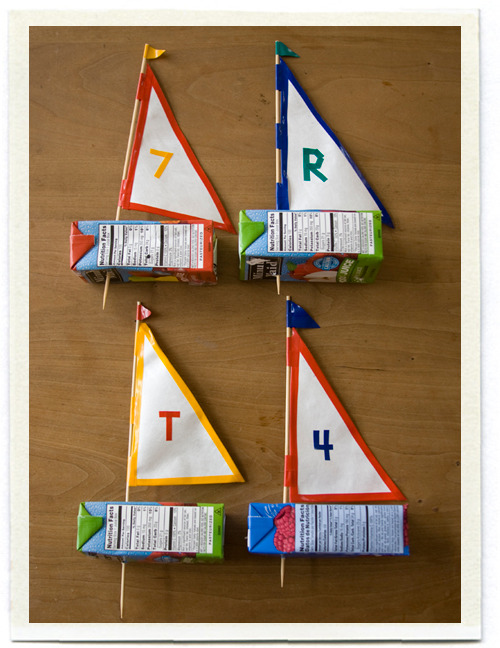 I found a some links to kid crafty projects at MakeAndTakes.com and one that I really like is the link to the juice box boats — these look so cute, and I believe the project could be used a time or two. The tutorial for making the juice box boats is at Inchmark.squarespace.com and they look pretty easy to make. As you’re looking for additional projects for the kids, check out our book Crafts For Kids — you’ll find an assortment of projects for children ages 2-5. Hopefully there won’t be toooooo many days that the kids can’t get outside for even a few minutes, but I always like to be prepared.